This post originally appeared on Marketplace Advertiser, Rosano Partners and is republished with permission. Find out how to syndicate your content with theBrokerList. Here are two things we all can agree on: (i) Social media platforms aren’t going anywhere and (ii) its use extends far beyond individuals simply being social. Social media use by businesses and brands has been steadily growing over the past decade, and the billions of dollars spent annually on advertising across these platforms proves this marketing tactic is here to stay. If you are in commercial real estate and aren’t leveraging the power of social media to promote your #CRE business, it’s definitely time to start. Through the strategic use of social media #CRE firms and individual Brokers can dramatically expand their business, increase their visibility and grow their customer base. All roads that lead to one place…the promise land of profits. To help establish the social media presence of your #CRE business, or to strengthen current efforts, we at Rosano Partners have created a four-part series dedicated solely to social media marketing. Part 1 was dedicated to everything Instagram, click here to check it out. Today we move on to Part 2, how to use Twitter to promote your #CRE business. Today we are focusing on using Twitter to market your #CRE business. Much like Instagram, Twitter is a fairly straightforward and easy to use social media platform. The main difference between Twitter and all other platforms is two-fold: (i) you are limited to 140 characters or less in your post (called a Tweet), and (ii) everything happens in real-time. (1) Tweet: A tweet is a message that is viewable to everyone who follows your profile. It must be 140 characters or less and can contain text, links, photos, .GIFs and videos. (2) Reply: See something and want to say something? When you click ‘reply’ you are responding to someone else’s Tweet. Replying is a great way to boost engagement. (3) Retweet: A Retweet is simply sharing someone else’s Tweet on your profile. You can either share the Tweet as is or you can add your own 140 character or less comment to give the Retweet context. This is called a ‘Quote Tweet’. Retweeting content that you think your audience will enjoy is a huge way to gain more followers and boost engagement. (4) Like: A like is the most passive form of engagement. It simple says, “Hey, I liked what you had to say.” It’s also a great way to bookmark a Tweet that you wanted to revisit at another time (say a link to an interesting article or infographic). All of your likes are aggregated directly on your profile. (5) Hashtag: You create a hashtag by placing the ‘#’ symbol in front of any word or phrase without spaces. When a hashtag is clicked it will aggregate all other Tweets that contain that same search term. (6) Mention: To get someone’s attention on Twitter you use the ‘@’ symbol before their name. When you do this they get a notification that you have mentioned them and that you want to engage. Twitter profiles are very basic and therefore super easy to set-up. Keep in mind that this profile serves are your #CRE brand and first impressions count. You should absolutely ensure to use each element in the profile and that it not only accurately reflects your message, but is consistent with what is on your website and other social platforms. (1) Twitter Name: Preceded by the ‘@’ symbol, your Twitter name has a limit of 15 characters and should contain something that identifies your business. For firms and Brokers it is ideal to include ‘CRE’ somewhere in your name (if that name isn’t already taken). Ex. You work in the Boston market, a name of @BostonCRE would be perfect. (2) Profile Photo: One of the two placeholders for images on your Twitter profile, this should be a logo for a #CRE business or a headshot for a CRE Broker. Keep in mind this is also the icon shown on every Tweet you post. (3) Bio: Here is where you explain who you are and what you do…in 160 characters or less. Be sure to include relevant hashtags and any other Twitter profiles associated with your business. Ex. #CRE Broker with 16 years experience specializing in #multifamily, #retail and #industrial assets. Part of the @RosanoPartners1 team. (4) Header Image: The second and dominant image on your Twitter profile, this serves as your visual billboard. (5) Pinned Tweet: If you have an important Tweet that you want front and center on your profile you can pin it to the top of the page. To do so click “more” on the Tweet you want to pin and select “Pin to your profile page”. 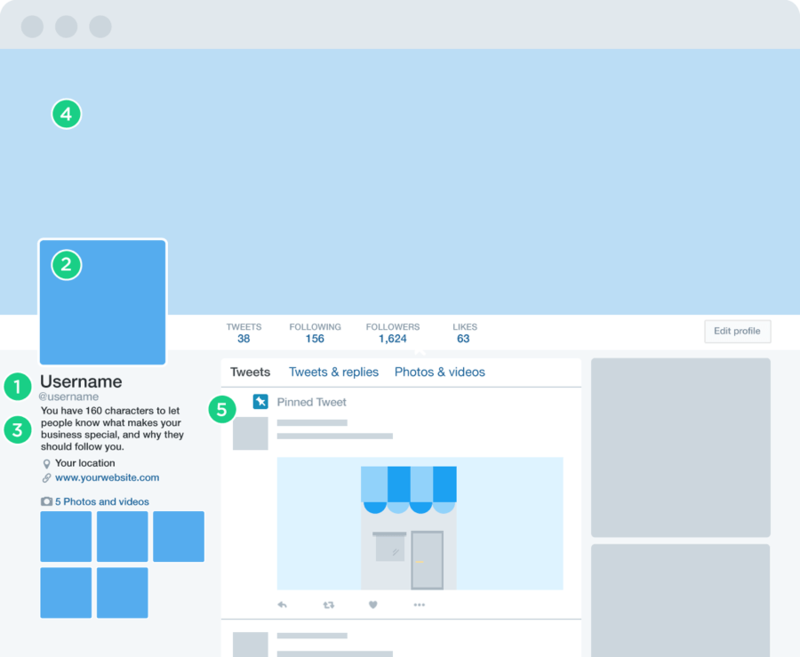 For more in-depth help on Twitter basics, visit Twitter’s own resource library to learn more. From promoting listings to introducing new services to announcing common area maintenance projects, Twitter is a fantastic way to market your #CRE business. Here are best practices to earn you more followers and to boost engagement. Like we said Twitter is real-time, and due to that, the platform is a very, very crowded place. To cut through the noise and to get your message in front of your intended audience there are a few best practices a #CRE business or Broker should adhere to. The golden rule is for every 5 Tweets, only one should be about your #CRE business or services. So, 20% of the content on your profile is selling yourself. The other 80% is sharing content that is relevant to your audience. Think of this way, you want to be known as a resource in your market. Someone that has their pulse on not only national commercial real estate news and trends, but also what is going on their home market. Hashtags should ALWAYS be included in a Tweet. This is a super powerful tool to expand reach and be a part of real-time, relevant conversations. For CRE business or Broker be sure to use hashtags like: #CRE, #JustSold, #justListed, #(City Name)CRE. Best tips: (i) Be sure to use no more than 2 hashtags per Tweet (ii) use event hashtags like #RECON17. one is best. Also, you can search for that perfect .GIF directly from Twitter’s extensive library. Simply click the ‘GIF’ button on the bottom of Tweet you are writing and search from there. Want to explore Twitter’s benefits for your #CRE business? If you want more information on how to get started, how to set up ads or how to use various features, visit the Twitter Business Resource Library. Here you will find tons of fantastic resources to drive you towards social media superstardom. For more information on #CRE tech, research and commercial real estate best practices, make sure to follow our Rosano Partners blog. We recognize that social media and technology are important elements to running a successful #CRE business and want to share our knowledge with you. Now, go get social! Rosano Partners was founded in 2006 by Sagiv Rosano. Our mission is to provide a full-service commercial real estate brokerage and property management platform to underserved markets in the Greater Los Angeles area. Some of our primary services include investment sales, leasing, tenant services and consulting and asset strategy. We constantly monitor market trends. This, in addition to leveraging leading technologies in the industry, enables us to provide our clients with up-to-date information on current and future opportunities. To learn more about Rosano Partners, go to RosanoPartners.com or connect with us on social media. You can also email us at .